Social media has emerged like an errant piece of debris from a tornado, and has smacked the world of business in its metaphorical face. Depending on who you talk to, this emergence of no-holds-barred communication has resulted in either the apocalypse for privacy and internal practices, or the advent of a new dawn of profitability and success. In any case, the plethora of social networking sites has led to a reevaluation of business practices. It’s no mystery that the area with the most important long-term implications for an organization is recruiting and staffing employees. One of the biggest and oldest problems for companies revolves around acquiring a talented and creative team – and digital gives the old, traditional methods a new spin. According to aA studyA [PDF] by the workplace psychologist groupA OPP, 39% of leaders said they still rely on gut instinct when making hiring decisions, and a quarter admitted that whether they liked someone personally was a major influence. These findings demonstrate that traditional hiring metrics, including quality of the cover letter and interview, compete in importance with the personal preferences of the hiring manager. Second, employers base hiring preferences on the applicant’s personality, sometimes even more than on the hard skills an applicant brings to the table. Social media tools and applications can offer a glimpse into these more personal aspects of an applicant beyond traditional hiring materials. 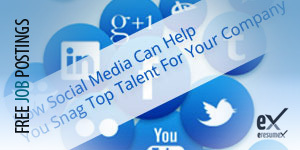 But are businesses actually using social media tools to hire? The answer to this question is surprisingly murky. A survey byA CareerXroads, a company that’s been tracking hiring sources for the past 10 years, found that 57.1% of respondents report that social media plays an important role in their direct sourcing program. A 2011 study undertaken byA JobviteA goes further, stating that 89% of companies planned to use social media in their hiring process that year, and that 64% of companies directly used social media to hire an applicant in 2011. Regardless of the confusion surrounding social media (which, by the way, should be expected given its rapid escalation in importance), there are proven techniques and applications in place, should a company wish to expand its hiring arsenal to the social sphere. Since most companies would like to have a large pool of talented applicants from which to choose, it behooves them to spend some time creating a dynamic social footprint. Alison Doyle, the job search guide forAbout.com, believes that some basic steps can improve the quality of applicants who find their way to a job through social media. For instance, publish engaging content focusing not only on what your company does, but how the company culture operates, to give insight into the inner working of the business. Also, create a strong employment brand on larger social sites such asA Facebook. Doyle also points out that employees who post positive things about their employer on personal social platforms make the company very attractive to prospects. For this reason, she encourages companies to allow employees to access social media during work hours, as they are more likely to post about their company then. This story illustrates two levels of active social hiring. First, the company found an employee that matched its criteria by examining his social sites online. Then, using those social sites, it appealed to his personality. Even though he was not interested at first, its knowledge of his persona enabled the company to obtain a perfect hire. So, harness the power of social media to reach talented people and land key hires within a company – that is the perfect scenario, right? Here are some of the most innovative tools I’ve found that can help you navigate the social hiring landscape. CrowdHired:A CrowdHired works through social crowdsourcing which, aside from being an overused buzzword, offers a dynamic approach to finding employees. The process is fairly simple: An employer selects advocates from his existing contacts and submits a bounty, or payment, that will be paid to both the advocate and the employee hired as a result of the recommendation. The advocate then recommends individuals from his network who he thinks would be a good fit. If the recommended person wants to apply for the position, he chooses whichever of his social networks he thinks will represent him best. CrowdHired works well by eliminating the need to dredge through a large number of potentially unqualified applicants, and instead operates through the popular method of using recommendations to find the top people. The bounty simply adds an extra incentive for advocates to get on board and really recommend the best of their contacts. HirePlug:A This is an app that sits on top of your company’s existing Facebook Page. It adds a tab that says “We Are Hiring” and allows applicants to view openings and apply directly from there. HirePlug not only leverages the network of your company but also employees’ networks. A company that uses this app can encourage employees to place the “We Are Hiring” tab on their profiles as well. The app also matches the skills from listed positions to profiles of friends within the employees’ networks. Employees can then send a recommendation from Facebook and via email. It tracks referrals so employees can be rewarded if their recommendation results in a hire. Unrabble:A Unrabble attempts to alleviate the issue of applicants submitting resumes that are, shall we say, a bit fluffed up. Instead, it institutes a relatively simple system of social “bragging” that requires proof to substantiate the claim. Each time an applicant “brags” about an accomplishment (increasing sales, successfully revamping a site, etc. ), they must also provide an introduction to a contact on Facebook or LinkedIn who will vouch for him. While the system isn’t foolproof, it offers a convenient alternative to wading through the piles of resumes from apparent miracle workers who single-handedly saved their company from financial bankruptcy, yet mysteriously received little enough compensation that they are now applying for another job. Social media offers a whole slew of new and exciting avenues for hiring, but it will not always provide the best solution for every company. That being said, a company that integrates social hiring practices into its repertoire will undoubtedly be able to reach many applicants who might otherwise have gone unnoticed or undervalued. Plus, they will be able to claim that they are “hip” and/or “cool,” or whatever the devil the kids are saying nowadays.